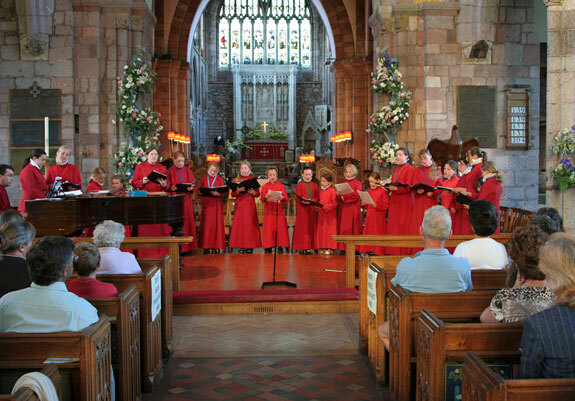 Crediton Parish Church is proud of its long musical tradition which can be traced back over hundreds of years. The Choir has always been at the centre of Church life. Today the Choir still maintains extremely high standards and is much respected in the West of England. The Choir currently comprises some 25 adults and 20 juniors, as well as the Director of Music, Assistant Organist, and 2 Choral Scholars. The choir takes its commitments to church music very seriously. They sing a weekly service at Crediton – sung Eucharist most Sundays and Evensong on the first Sunday of the month. The music list, which details the service schedule of the choral music, can be found under ‘Services and Events’. The choir visits other Cathedrals, Abbeys and churches to sing Evensong. Cathedral visits have included Exeter, Gloucester, Truro, Salisbury, Hereford, Llandaff, Wells and Bristol. In addition the choir makes a tour every 2 or 3 years to a town linked with Crediton. They have also featured in radio and television broadcasts, including Christmas services on BBC Radio 4 and BBC Radio Devon. Does your child like music? Do they enjoy singing? Would you like them to benefit from a free musical education rarely found outside a specialist cathedral choir school? If so, then the Holy Cross Choir is the ideal place for them to come and sing. The voices of the treble section of children aged between 7 to 18 form an integral part of our music. Our trebles are given individual musical training to a high standard; this training is not just in singing, but in all aspects of musical theory and Christian faith. This level of training early on provides them with a great advantage in musical terms; many of our choristers have continued with music to degree level and are now following successful musical careers. Our junior choristers also receive a small sum of money each term depending on how far they have progressed with their training, and are paid additionally for any weddings at which they sing. However, the choir is not just about singing! The junior choristers enjoy an active social life, including swimming, ten-pin bowling, trips to the cinema and pantomime and choir outings. There is also a Choir Social Club after the junior rehearsal on a Tuesday. Healthy competition is encouraged, with prizes given to both the best chorister and winning chorister team of the term. The atmosphere within the treble section is very friendly and welcoming, and provides a unique place in which children can both learn and flourish. Holy Cross is very proud to announce that Helena Paish, a member of our junior choir, won BBC Radio 2 Young Chorister of the Year in November 2014. Helena was a valued member of the choir before joining the choir at Truro cathedral. Two members of the choir, Emma Richards and Issy Tuffin-Donnevert were finalists in the competition. Issy has since gone on to be Choral Scholar at Southampton University. 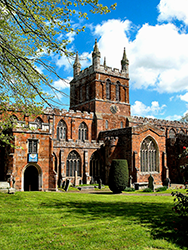 The Collegiate Church of the Holy Cross, Crediton, offers up to three Scholarships every year, each worth £900 per annum. One of the scholarships is supported by the Ouesley Church Music Trust. Our Scholarships are available to organists and singers (sopranos, counter-tenors, altos, tenors and basses). We aim to appoint one organ scholar and up to two choral scholars at any one time. The purpose of the Organ and Choral Scholarships at Crediton is to support the work of the choir and maintain the standard of music making in the church. The Scholarships are quite flexible, and offer many opportunities: besides singing, Scholars have the chance to direct the choir, perform, organize concerts and recitals, help with the individual training of Junior Choristers, and take part in the choir’s various social activities. Some of our scholars have gone on to take up appointments and scholarships at cathedrals, major parish churches and Oxbridge colleges. Scholarships are normally held in conjunction with degree courses (undergraduate or postgraduate) at University of Exeter, but we also welcome gap-year scholars. The Scholarships are normally tenable for up to three years, subject to a yearly review. All applicants will be subject to an enhanced DBS check. If you would like to find out more, please contact the Director of Music, Mark Perry, who is more than happy to answer any questions. He can be contacted on markperry999@aol.com .